In the United States, millions of Americans injure themselves every year. While some of these are major injuries that can be life-threatening or affect their daily activities for the rest of their lives, many cases are simply minor injuries that happen at any time. Wounds such as cuts, scrapes, and scratches are common injuries where the skin tissue breaks, exposing the inner layers of the body and, sometimes, producing some blood. In minor cases, the wound is very superficial and does not call for a trip to the emergency room. The body heals itself overtime, and during these cases, the blood cells work to close off the wound and begin healing itself. However, given that it can serve as an entryway for bacteria and viruses into your body, you might want to take precaution and clean the wound. In this article, I’ll teach you how to determine what kind of wound it is, how to best treat it, and how to tell if it’s more than a common wound and if you should head to the nearest emergency room. If you’ve experienced getting a wound before, you know what it looks like after the skin heals itself. The scab protecting the healing skin peels off on its own, and the skin has a different color from the rest of your body. That’s because when you get a wound, the structure of the skin affects the way the wound heals itself. How Do Wounds Heal Itself? The top layer of the skin, called the epidermis, consists mostly of hardened cells called keratinocytes. This provides your body with the most protection, and since we’re always shedding dead skin cells, it’s the easiest layer to repair. It’s why, when you have a small nick from a knife that only reaches the epidermis layer, you’ll notice there’s barely any blood. The open skin may hurt, but it’s barely noticeable and heals relatively faster. However, when a wound cuts deep into the dermis layer, it cuts into the layer with blood vessels, nerves, and glands that help the skin perform its function. When this happens, it triggers the stages of the regenerative process. During the first stage called hemostasis, the skin responds to the two immediate threats: your epidermis is open and can let foreign bodies like bacteria in, and you could start bleeding out. When this happens, the blood vessels perform vasoconstriction, which is the process of tightening itself to avoid excessive bleeding and forming a blood clot to keep the blood in and the pathogens out. Hours after the wound is made, your skin will begin to turn red, signaling the next stage, inflammation. The body sends special cells, including white blood cells, to fight any pathogens that might have entered during the clotting. It also sends growth factors to speed up healing in a stage called phagocytosis. Days after the wound is clotted, the proliferative stage occurs when fibroblast cells enter the wound and produce collagen to form connective skin tissue. The epidermis cells divide to reform the outer layer of the skin while the dermis closes the wound. In the final stage, remodeling, the wound matures, and the collagen is rearranged and converted. Depending on how deep and how big the wound is, it can take months and even up to a year for the wound to be fully healed. But because the skin is newer than the skin around it, it looks visibly different from the rest of the skin. The tensile strength of the new skin is improved, as well as the affected tissue underneath. Depending on the severity of the wound, the new skin will retain around 50 to 80 percent of the old skin’s function. It’s why some new skin tissue can’t grow hair as it did before. However, because it takes a long time for the skin to fully heal, scarring has become a major cosmetic issue. Cuts are open wounds that occur from long, pointed objects such as knives and needles. These are also known as puncture wounds for minor cases and lacerations for major cases. Punctures to the epidermis may not bleed too much, but major cuts can cause damage to your internal organs down to your bones and can cause internal bleeding. An example of a minor cut is when you’re in the kitchen handling knife and you accidentally cut your skin. Or, when you’re sewing and you prick your skin with a needle. While minor cuts don’t bleed heavily, they’re the wound that’s vulnerable to infection because a foreign object punctured your skin. It’s especially true if the sharp object is an animal bite or a rusty object. In this case, you’ll need immediate medical attention to rule out possible infection. Scrapes, grazes, or abrasions are when your skin has been scrapped or rubbed hard enough that it’s rubbed raw or you’ve rubbed most of the outer layer away. It’s like when you were a child and you skinned your knees from falling on the ground. There’s no sharp object or pointed rocks on the ground, but you stood up and saw blood; that’s your skin rubbed away and exposing the inner layers. It’s common to get a scrape on joints such as elbows, knees, and shins. They can be very painful because it exposes the skin’s nerve endings. Minor scrapes hardly ever bleed and are not as serious as cuts. They can be treated at home, but those with deeper scrapes such as those acquired in accidents in the workplace may cause profuse bleeding and requires immediate treatment. A scratch is similar to a cut and abrasion, except the incision is usually not that deep. A cut penetrates the skin and leaves an incision, but a scratch usually only leaves a mark or very tiny incision on the skin. When you’re in a fight and someone scratches you with their fingernails, they’re not trying to puncture your skin, but instead leave a visible mark, sometimes damaging the skin in the process, causing scratches. Scratches may turn red or become infected if left untreated. These are usually made accidentally or when in a combative situation, especially for children. Most of the time, these marks leave on their own. But if there is broken tissue, it may leave scars. There are many other types of wounds, each ranging in size and severity. In the case of cuts, scrapes, and scratches, while these will heal on its own, it’s a safety precaution to clean and cover the open wound until the blood clot covers it. To treat these three, start by slowing down the bleeding. Cover the wound with a clean gauze or piece of cloth and apply gentle pressure. Next, clean the wound with alcohol wipes, antiseptic wash, or clean lukewarm water. Next, remove debris on the surface of the cut. Lightly roll a cotton swab dipped in hydrogen peroxide over the area to clean it. This may be painful for you, so get assistance if needed. Once clean, apply over-the-counter antibiotic cream to prevent infection. Depending on the size of the wound, cover it with a bandage, a band-aid, or a gauze. Change the band-aid when its cotton is filled with blood orbecomes wetor dirty. Debris or a part of the object that caused the wound remains inside your skin. Do not try to take it out yourself because you may risk infection. The wound, even after cleaning, shows signs of infection such as swelling, pain, pus, warmth, or liquid leaking out of the wound. 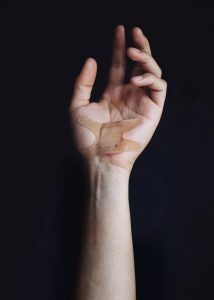 In case the wound was caused by a bite or something dirty, you may have to take antibiotics or a tetanus vaccine. You can save a trip to the emergency room and avoid infections if you know how to treat minor wounds. Make sure your house is equipped with supplies needed to treat wounds in case it happens to you or anyone in your household. However, get medical attention immediately if you believe your wound cannot be treated with first aid and home care alone.